Israel ANALYSIS: The Gaza Border – Escalation Into War or An Agreement and Relief for Residents? ANALYSIS: The Gaza Border – Escalation Into War or An Agreement and Relief for Residents? A fire in a wheat field caused by kites flown by Palestinians, near Israel’s border with the Gaza Strip. It’s been quiet on the border between Israel and the Gaza Strip for three and a half years. Since the conclusion of Operation Protective Edge in 2014, Israeli defense elements have defined the situation during this time as something more than merely quiet. It has been almost absolutely still, they say. Not a single Hamas rocket has been fired towards Israel, and there has been hardly any rocket fire in general. Here and there throughout this long period of time, a few terrorists — members of one of about ten “errant groups” who do not belong to Hamas — banded together and fired mortar rockets at Israel. More than they wanted to harm Israel, they wanted to hurt Hamas, the result of internal disagreements between the various organizations, or because they were incentivized to do so by their funding entities—Iran, Hezbollah, Islamic State or global jihad groups. After each such incident, Hamas has always hastened to convey the message to Israel that it was very regretful about what happened. “It’s not us, it’s them, and we’ll take them to task for it.” Indeed, the Hamas police force would hurry to the rocket launchers’ homes, and if they were there, would arrest them and beat them in public in the city’s streets, so that people should see and be afraid to copy them. Sometimes, they would also send them to jail for a short time, and then would release them late at night to return home—away from public eye. However, Israel still made sure after each such incident to retaliate with artillery fire against Hamas positions, to convey the message that the organization in power in the Gaza Strip had failed: They had not taken action to prevent the rocket fire. This is how things have been since the end of the last military confrontation with Israel in 2014, which dealt a most severe blow to Hamas in general, and to the residents of the Gaza Strip in particular. Eighteen-thousand homes were destroyed by Israel’s airstrikes. Yes, that number is no mistake: 18,000 Gazan homes were destroyed during Operation Protective Edge. Many were completely leveled, while some were so damaged as to be uninhabitable. About 1,000 Gaza residents — two-thirds of them members of Hamas and other terror groups — paid with their lives during that operation. About 3,000 were injured. Before Protective Edge, residents of the Gaza Strip had water service for between eight and nine hours a day. Since then, they have only four hours of water and four hours of electricity each day. Many of the automobiles that are roadworthy are parked, unused, because there isn’t enough fuel for them all. The authorities worry first for themselves and their cronies, and if there are a few bits of energy resources left, they distribute them, by the hour, to others. Suddenly, a few weeks ago — things changed. Hamas — which was sitting on the side and actively preventing others from taking action against Israel—suddenly decided to shuck the image of the “deterred group” and organized demonstrations and riots. They ignited tires and sent flame-bearing kites, causing huge fires in Israel’s fields. And if all this was not enough, terrorists from all the different organizations including Hamas renewed their rocket fire, and drove tens of thousands of Israeli residents into bomb shelters and reinforced rooms. Within a short time, the situation on Israel’s southern border escalated dramatically. Why? What led Hamas, which displayed so much caution for so long, to suddenly get off the fence and renew direct conflict with Israel? And the big, overarching questions: Where is this all going? Can the situation deteriorate into a major conflict? Hamas changed the rules of the game, not Israel. The situation as it stood in recent years was very comfortable for Israel. Farmers could work their lands; construction began again in towns near the border. Everyone breathed a sigh of relief. And suddenly, everything turned over; we are back to where we were on the eve of Operation Protective Edge, four years ago. The first stage was characterized by “popular” violent activity organized by Hamas, accompanied by terrorist activities and efforts to cross into Israel. Each Friday, and sometimes in the middle of the week as well, Hamas organized violent demonstrations of tens of thousands of people along the border fence with Israel. The rioters repeatedly tried to break into Israel territory, while the IDF at first tried to prevent them from doing so using gentle crowd dispersal measures. When those did not succeed, and the demonstrators reached the fence and tried to damage or dismantle it, or opened fire at the soldiers, the IDF retaliated with cautious fire. That is what led to those casualties we have heard about in the last two weeks. More than 100 people have been killed in the demonstrations, and the Palestinians themselves admit that more than 80 percent of them belonged to terror organizations. During this first stage, Hamas refrained from firing mortars and missiles into Israel, and successfully enforced the rocket fire ban on other organizations as well. The purpose of this was to telegraph the false message that these “popular demonstrations” were non-violent. By not firing, they wanted to make it clear to the arena of global public opinion that Israel is retaliating with fire against their “soft” measures, and thus they sought to score hasbarah points in the world at large. But that, of course, did not prevent them, under the cover of “nonviolent” demonstrations, from placing explosive devices on the fence. The terrorists in Hamas’ military wing, who were prominent among the front-line demonstrators, made repeated efforts to breach the fence and infiltrate into Israel. B’chasdei Hashem, they did not succeed. 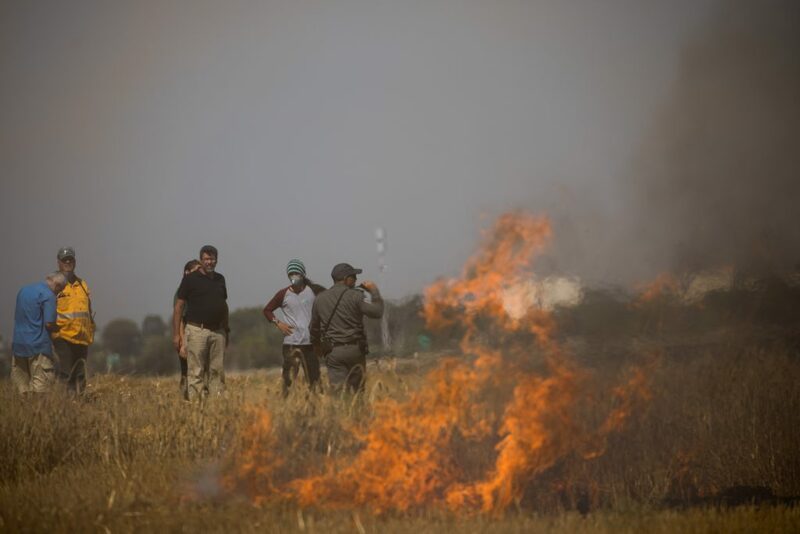 At the same time, they began to send hundreds of kites carrying Molotov cocktails, and helium balloons containing explosives, which fell onto Jewish-owned fields in the Negev and set them on fire. By the end of last week, some 700 kites had been dispatched. Of these, 450 were successfully shot down through technological means. However, 198 of those kites that landed in Israel ignited huge fires, destroying 9000 dunams of crops and forest land, and seriously damaging nature preserves in southern Israel. Israel has solicited all the leading technological minds and relevant industrial firms to search for solutions to block the skies from these “terror kites.” To date, they have not been particularly successful. Security sources warned this week that Israel won’t be able to restrain itself much longer regarding the terror kites; that the army is preparing for the possibility of a harsher response. This week, the army also presented Israel’s response plan to a group of senior American army officers who visited the southern border. Then came the second stage of the escalation. Ten days ago, Hamas and Islamic Jihad began direct fire at Israel. They shot more than 100 mortars, rockets and missiles. The increased intensity of these offensive measures along the border fence led to Israeli retaliation: Israel bombarded more than 120 terror targets of these out-of-control Gaza groups. The strikes were accurate and harsh, yet cautious and measured. The IDF knows that after each incident of rocket fire from the Gaza Strip into Israel, the terrorists quickly clear out their bases, in the assumption that they will be targeted by Israeli aircraft or artillery fire. Israel did indeed bombard the bases, but no terrorists were there. The damage was heavy, but there were no human casualties. At this point, both sides began to make a reckoning, tallying up what they had achieved thus far and where they had failed. Hamas earned some image points on the international stage, but couldn’t make any operative gains, such as penetrating Israeli territory or harming IDF soldiers. That caused a lot of frustration in the organization, and led them last week to take things even further. They began to dispatch small terror cells to carry out targeted operations on the Israeli border. These cells sabotaged Israeli army equipment, placed bombs and tried to cross the fence; they even fired at IDF forces, all leading to an increased IDF reaction, and to Hamas and Islamic Jihad moving into the stage of firing rockets at Israel in a “steady drip.” Every few hours they fired one or two missiles, which, of course, put Israeli residents along the border under pressure. At the same time the “popular” demonstrations — rioters, burning tires and massive dispatches of explosive-rigged kites — continued, led by Hamas. At this point, the Egyptians got involved, because the Egyptian army considers itself the chief mediator between the two sides. After a night when Israel bombarded 115 terror targets, the Egyptians invited the heads of Hamas to Cairo and pressured them to stop escalating the situation. Hamas accepted the Egyptian proposal. Israel did not want a ceasefire agreement and only made a declaration that if Hamas and the other organizations would desist from their actions, Israel, for its part, would stop the retaliations. Battered, Hamas accepted the Egyptian proposal and quiet reigned for… 48 hours. Apparently, Hamas policies have not really changed much, because the violent demonstrations at the border and the accompanying attacks have not ceased. The kites and efforts by small cells to carry out attacks on the border have not ceased either. This potentially explosive situation can quickly escalate from the interim stage — where we are now — to a full-blown conflict that will force Israel to re-enter the Gaza Strip and take military action from the air and on the ground. Israel is not interested in this happening. Perhaps Hamas is not either. But the Gaza radical group is under heavy pressure from the street, because Hamas cannot provide the basic needs of the citizenry on a day-to-day basis. Hamas thinks that if they will bring the conflict with Israel to the conflagration point, Israel will have to offer them more generous financial aid. The nearest date with a potential for a conflagration is this coming Friday, June 8, which marks two central events in the Arab-Muslim world: It is “Jerusalem Day,” the day of solidarity with the Palestinians initiated by Iran around this time each year, and it is the last Friday of the Muslim holiday of Ramadan. If Hamas doesn’t want war, and its intention is only to pressure Israel to give in to their financial demands, then why is it firing missiles and continuing to inflame the situation in the south? The rocket fire from the Strip is being carried out by Salafist Islamic organizations, who Israel likes to call “errant organizations.” They are errant in that they do not obey the orders of the authority in the region — Hamas. These radical Muslims are interested in turning the Gaza Strip into a radical Islamic zone, controlled by one of their organizations, or even by ISIS in Sinai. But they know they will not be able to overpower Hamas. Therefore, they fire at Israel, in the hope that Israel will retaliate against Hamas and perhaps will even enter and occupy Gaza, and then Hamas will fall. Initially, Abu Mazen will return to Gaza, and then they will be able — gradually and more easily — to take his place. In Israel there are those—including among the senior defense echelons—who believe that the most ideal solution for Yerushalayim is to reach an agreement or a long-term arrangement with Hamas to disarm, and that in exchange Israel will switch to a mode of extensive economic aid to Gaza residents, together with the international community. The Egyptian mediators are trying to lead in this direction, but they are not being successful. It is possible that other mediators are needed. But even then, it is not certain whether Hamas fully understands its situation and is ready to disarm from weapons and military capabilities in order to achieve a better hold in its territory and some reprieve for the residents. And without a solution, what may happen? First Scenario: Terror and violence will continue in their current form and at their current level, without escalating into a broader military conflict. This scenario includes the continued “popular” violent demonstrations directed by Hamas, together with attacks against the IDF along the border fence with explosive devices, gunfire, explosive kites and other burning objects that will be dispatched toward Israeli towns, and rocket and mortar fire toward Israel at varying frequencies and intensities. This is all under the control of Hamas, and it would be on a level that will not bring a broader military conflict, but rather will exhaust Israel and focus international Arab attention on the Gaza Strip. It will galvanize the Arab world and the international community to offer significant financial aid to Gaza. The significance of this scenario is the policy whereby Hamas walks the fine line that generates an explosive situation that could lead to a full-fledged military conflict on very short notice. Second Scenario: Being dragged into a broader military conflict as the result of the dynamics of an escalation of events: Such a conflict might manifest itself by firing rockets and mortars on a broad scale towards Israeli towns near the border and possibly deeper into Israel. This scenario would lead to significant IDF retaliations against “assets” of Hamas and of other terror groups, and perhaps even targeted assassinations, that is, the killing of senior officials in these terror groups. This scenario could quickly develop into a ground war in Gaza, even if Hamas and Israel are not interested in that happening. Third Scenario: The sides reach understandings that lead to long-term quiet. Such an agreement would be based on an absolute suspension of demonstrations and “marches of return,” of efforts to infiltrate Israel, of attacks on the border and of rocket fire into Israel. In exchange, Hamas will strive for steps to bring about a significant improvement in the economic situation in Gaza—for example, financial aid from Arab nations and other nations; opening the Rafiach Crossing to and from Egypt and Gaza, expanding the amount of merchandise allowed into Gaza from Israel, and suspending sanctions of the Palestinian Authority on Hamas and Gaza residents. Unfortunately, it is doubtful whether Hamas will agree in such a scenario to provide anything significant in return, such as stopping to arm itself militarily and turning its priorities towards the financial rehabilitation of the Gaza Strip. Which of these will develop? We are likely to find out in the next few days.